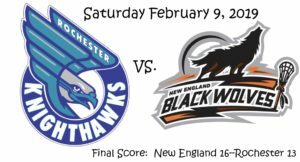 The New England Black Wolves (4-3) hosted the Rochester Knighthawks (2-6) in front of 5,766 fans on Saturday night February 9. Both teams struggled last weekend and a win for either team was important to keep pace with the rest of the Eastern Division. The Black Wolves jumped out to a big halftime lead, only to allow the Knighthawks back in the game during the second half. The comeback was ultimately unsuccessful, and the Black Wolves returned to above .500 on the season. Final Score: Rochester-13, New England-16. During this very exciting, high scoring game three Black Wolves players achieved personal career milestones. First, Callum Crawford (5G, 5A) reached 900 career points in his 14th season on his second goal of the game. “Been in the league for a long time, took me a long time to get rolling,” said Crawford. He followed up with a team attitude that I’m sure the whole locker room appreciates. The first quarter at Mohegan Sun Arena went back and forth. Rochester’s Scott Campbell (1G) scored the first goal of the game 3:47 in, but Crawford was quick to answer with his first of the game. In fact, Crawford was the only Black Wolves player that was able to find the net in the first, ending the quarter with a hat trick. Rochester stretched the lead to 3-1 on goals from Kyle Jackson (2G, 6A) and Mike Burke (1G, 4A) before Crawford scored two in a row to tie the game 3-3 with 5:29 left to play. With 2:11 remaining, Brad Gillies (1G) scored unassisted in transition, giving Rochester the lead going into the break. At the end of the first quarter, Rochester led New England 4-3. The second quarter was one sided as the Black Wolves defense closed the door on any Rochester opportunities. Goaltender Alex Buque looked unflappable again, a week after holding a potent Georgia offense to just 10 goals. While the Knighthawks went scoreless for the quarter, New England scored five goals. Leblanc opened the fury 2:18 in and tied the game 4-4. For over eight and a half minutes, the Rochester defense also stood tall and forced low percentage shots. Tyler Digby (3G, 2A) broke the tie with two goals within a minute, the second coming with 3:23 remaining in the half. Crawford and Dereck Downs (1G) found the net in the closing minutes, giving New England a commanding halftime lead. Starting Rochester goalie Angus Goodleaf was briefly relieved by Warren Hill who allowed one goal in 2:49 of action before Goodleaf returned. At the half, New England led Rochester 8-4. The New England run continued into the third quarter. In just over four minutes of play the streak was stretched to eight unanswered goals. David Brock (1G) opened the quarter with an unassisted goal 1:29 in, and goals followed Digby and Leblanc. Cody Jamieson (3G, 3A) finally ended the Rochester drought that lasted 21 minutes 37 seconds with his first of the game 4:26 in. Joe Resetarits (4G, 3A) scored just over two minutes later, but the momentum was quickly interrupted by a transition goal from Andrew Suitor (1G, 1A). Cory Vitarelli (1G, 1A) scored with 19 seconds remaining to bring the Knighthawks back within five. At the end of the third quarter, New England led Rochester 12-7. Rochester kept things interesting in the fourth quarter as New England seemed to slack off a little on the defensive end. Jamieson; Jackson; and Resetarits all found the net in the first two minutes and change to cut the Black Wolves lead to just two goals. The veteran Leblanc slowed things down and fired in the answer, but Resetarits scored his second of the quarter 5:28 in, keeping the home crowd anxious. Nishimura’s first NLL goal couldn’t have come at a better time. His streak down the turf was unimpeded by any defender and he easily beat Goodleaf one on one. Obviously fired up by the rookie’s big moment, Reilly O’Connor (1G, 4A) scored his lone goal of the game just 26 seconds later to stretch the lead to 15-11. Rochester again dug deep and scored two in a row. Jamieson and Resetarits provided the goals. With 2:16 remaining, again they were only down two goals. But it was too little, too late. Crawford scored on the empty net with 59 seconds left to bring us to our final. Final Score: Rochester-13, New England-16. The New England Black Wolves (4-3) have a double header against the Philadelphia Wings (1-7) next weekend. They play in Philadelphia on Saturday, February 16 at 7:00 PM EST and then host on Sunday, February 17 at 3:00 PM EST. 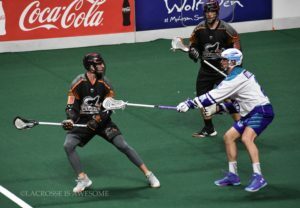 The Rochester Knighthawks (2-6) enjoy a week off and then host the Buffalo Bandits (7-2) on Friday, February 22 at 7:30 PM EST.